If you've ever watched a Blue Angels demonstration, you've probably wondered who on earth was flying those jets. And if you've pictured a woman, you'd have been wrong, but not for long. Marine Capt. Katie Higgins is about to become the first woman to perform in the Blue Angels, the popular moniker for the U.S. Navy Flight Demonstration Squadron. While Higgins, 27, isn't the first female squadron member — Navy Lt. Cmdr. Amy Redditt Tomlinson became the first female to join the Blue Angels in 2010 — she'll probably be the first to perform in a demonstration. "Honestly, I was in shock," the 2008 Naval Academy graduate told the Baltimore Sun about hearing the news. "It was something I had dreamed about for a while, and to have it come into fruition was amazing." Higgins's addition to the Blue Angels breaks the glass ceiling for two reasons: Besides possibly becoming the first female Blue Angel to perform, she will be joining the squadron alongside Marine Capt. Corrie Mays, marking the first time two female Marine Corps officers have been selected to join the squadron at the same time. While Higgins is listed as a demonstration pilot, it appears Mays will be taking on the role of events coordination office, and it's unclear whether she'll also get to perform. According to the Baltimore Sun, Higgins will be flying the C-130 Hercules cargo plane known as "Fat Albert," which is a bigger aircraft that flies slower and lower than the jets at air shows. It's a task that will surely come naturally to Higgins, whose father, two uncles, and grandfathers were all pilots. Higgins is expected to start training in January, with her first performance scheduled for next March. At the end of World War II, Adm. Chester W. Nimitz, the Chief of Naval Operations, called for the formation of a flight demonstration team in order to promote public interested in Naval Aviation. The Blue Angels performed their first flight demonstration in June 1946 in Jacksonville, Fla. The name "Blue Angels" was chosen by the original team, who discovered New York City's Blue Angel nightclub as they were planning a show in the city. An estimated 11 million spectators view the Blue Angels' air shows each year. During a show, the jets will get as close as 18 inches from each other while performing the Diamond 360 maneuver. The pilots can go up as high as 15,000 feet and as low as 50 feet from the ground during air shows. Speeds range from 120 mph to 700 mph, both performed by solo pilots, during shows. 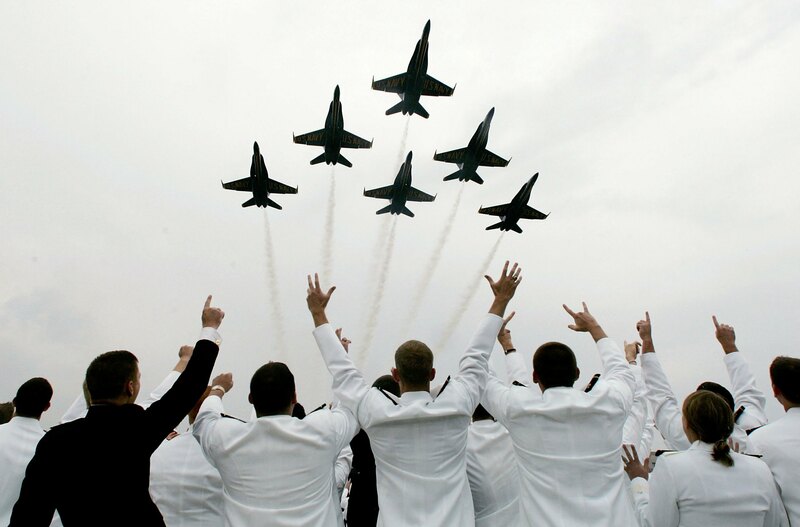 Blue Angel applicants must be carrier-qualified, active-duty Navy or Marine Corps tactical jet pilots with a minimum of 1,250 flight hours under their belt. According to its official website, the mission of the Blue Angels is stated as "to showcase the pride and professionalism of the United States Navy and Marine Corps by inspiring a culture of excellence and service to country through flight demonstrations and community outreach."